Is your garage door stuck? With a little bit of troubleshooting, you can easily identify the problem and get opener working again quickly. Alternatively, getting a quick diagnosis may also be of help to describe the problem if you need to call in professional help. If your remote control or keypad stops working all of a sudden, try to operate it by moving closer to the door. When you are too far away, you may be out of range of the receiver. If this doesn't do the trick, make sure that the receiver is not damaged. Sometimes, the remote control or keypad require a reset. Consult the instructions provided by the manufacturer to learn exactly how to do that. If you hear a grinding noise as you attempt to open the door, but the door doesn't actually move, the main drive gear is probably the issue. The main drive gear is actually the most common component that fails in garage door openers, so you may need to have it replaced by a professional. It is possible to replace it yourself, but the process is often difficult for the average DIY-fan because there are multiple components that require removal before getting at the gear. Sometimes, the door opens correctly but doesn't close all the way. There are multiple common causes for this, including the need to readjust the close limit switch, or realign the safety sensors. Sometimes, rusted or damaged rollers may lead to the bind of the door in the tracks. If the wall switch works well but you noticed that your remote doesn't open the door anymore, check the batteries first. If you still get nothing, your remote or receiver may be the problem, which means that you may need a new one. 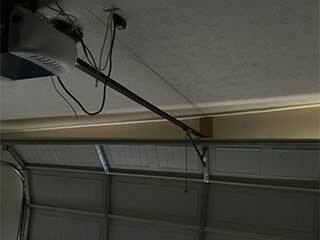 You can try universal remote if you can't find a suitable replacement for your garage door opener model. Alternatively, you can have a new receiver installed instead.